I am so excited to begin a new series for True Classics: Sci-Fi Sundays! I love classic film, and I love sci-fi. So it’s only logical that I share my love of these genres by bringing you a new series dedicated to classic cinematic works of science fiction. To kick off the series, I’ve reviewed one of the staples of this genre: the 1956 treasure Forbidden Planet. Forbidden Planet is the story of the crew aboard a spaceship, who travel to a distant planet in order to investigate a group of scientists who disappeared there twenty years prior. Upon their arrival, they discover that only Dr. Morbius (Walter Pidgeon) and his daughter, Altaira (Anne Francis), remain alive. Altaira has never known men other than her father, and is thus delighted to meet the young crewmen. Does this plot sound familiar? If so, you’ve probably read Shakespeare’s The Tempest. The plot is loosely based on the Shakespearean drama, but don’t worry if you can’t recall the characters and story of the play; it won’t take away from your enjoyment of the film. The parallels do start to diverge, however, and take on an intriguing science-fiction twist, when Dr. Morbius explains that the rest of the members of his expedition (save his wife, who died of natural causes) were killed by strange, invisible forces on the planet. The crew learns that the previous inhabitants of the planet were a species known as the Krell, who brought about their own demise with their technology to create beings and objects using the subconscious mind. If I had to choose one word to describe this film, it’d be the word “fun.” It’s not the most intelligent word, and it’s not going to win me the Pulitzer, but it adequately sums up my motive for watching this film over and over. 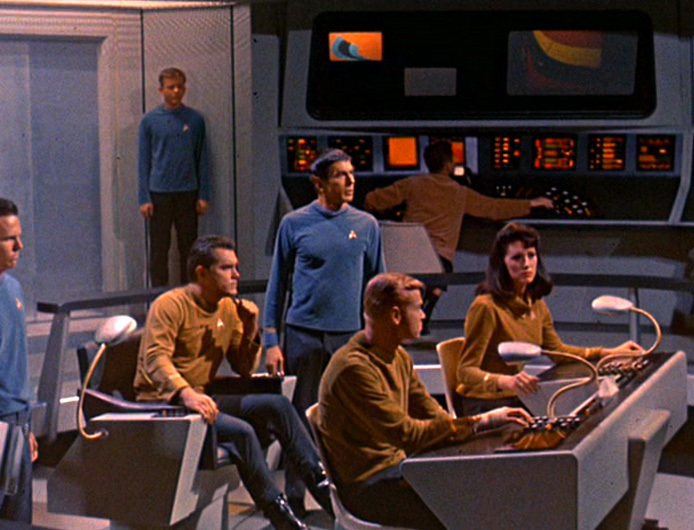 Robots, spaceships, a Shakespearean plot, Leslie Nielsen; what more could you ask for?! In fact, this film inspired many other sci-fi favorites, and one big one in particular: Gene Roddenberry reportedly stated in his autobiography that Forbidden Planet influenced his concept for the TV series Star Trek. That influence is certainly obvious in “The Cage,” the pilot episode. There are striking similarities in the plot; in each, the crew aboard a spaceship travels to investigate a distress signal from a distant planet where they discover an alien race that has the ability to produce terrifying illusions. The producers of the film were initially wary of the experimental score for the film composed by Louis and Bebe Barron, which was made up of only electronically-generated sounds with no conventional instruments, and so they conducted a special preview. The film was such a hit with the preview audience that the producers would not even permit editor Ferris Webster to make a final cut; instead, they released the film in its “as is” state. Filmmakers also reportedly simply cut part of the last scenes in order to speed the progression of the film, hoping that audiences wouldn’t notice the awkward transition. When Brandie described this film to me as “Shakespeare in space,” I instantly knew I would love it, and my instincts were correct. Not only does it have a fun murder mystery plot, but it’s packed with literary references and studies into the subconscious mind. Granted, the pacing of the film can be a little slow, but the surreal scenery along the way is enough to keep one interested long enough to enjoy the payoff at the end of the film. 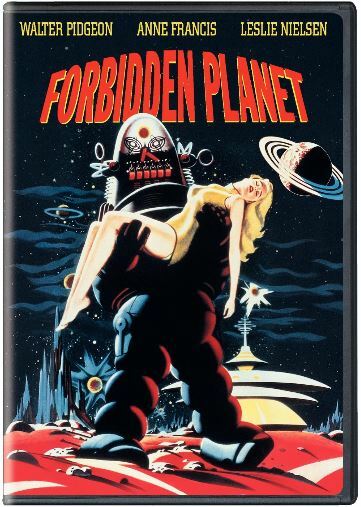 To celebrate the first installment of Sci-Fi Sundays, we’re giving away a DVD copy of Forbidden Planet! Entering the contest is quite easy: I’m going to ask a trivia question below, and if you know the answer, email us at trueclassicsblog (at) gmail dot com by 11:59PM EST this Wednesday (August 7th). DO NOT POST THE ANSWER IN THE COMMENTS. If you are correct, your name will be entered into a drawing to win! What is the title of the episode of Doctor Who that was based on the plot of Forbidden Planet? Contest rules: contest is only open to residents of the United States and Canada. We will contact the winner via email and he/she will have 48 hours to respond with a mailing address. If the winner does not respond within the designated time period, another winner will be drawn. Good luck! And make sure to check back later this month for another installment of Sci-Fi Sundays. You’ve written well about one of my very favorite movies! 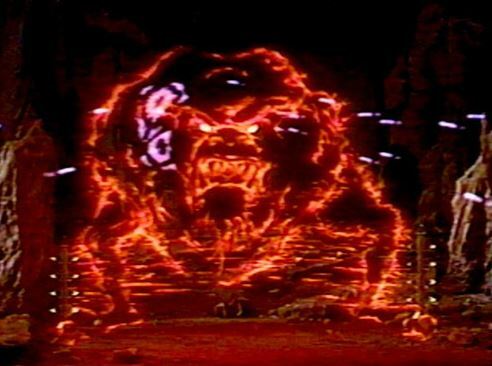 I still remember seeing this as a kid and being blown away by the giant Krell laboratory and the really cool monster becoming visible in the electronic fence. Fabulous stuff! Darn it, though, I never watched Dr. Who and can’t answer your question for the contest! Oh well, it was enough fun reading such a good article about this wondeful movie! Sarah, I’m so glad you chose to write about FORBIDDEN PLANET for your inaugural sci-fi post. I love that you came up with the idea for this feature–I can’t wait to see what you review next! My favorite genre! And you write so well! I vaguely remember seeing this movie and you have made me want to see it again.